OutBack Power, based out of Arlington, WA and founded in 2001, is an off-grid inverter manufacturer. By keeping their focus specifically on battery based systems, they have become a leader and innovator in this type of application. The OutBack MATE is a complete system controller and display for both the OutBack FX inverter/charger and FLEXmax MPPT PV charge controller. It provides a display of the operation as well as allows control and adjustment of the set points. The OutBack Mate also coordinates the operation of the entire system to maximize performance and to prevent multiple products from conflicting. 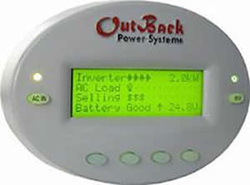 A single OutBack MATE is able to connect to multiple FX inverter/charges, FLEXmax MPPT PV charge controllers and any other OutBack power conversion and control products offered in the future. A maximum of ten OutBack products will be able to be connected to a single MATE via CAT 5 / Ethernet type cabling with 8 wire RJ45 modular connectors and the OutBack HUB communication manager. The OutBack MATE includes a 4 line back lit LCD display with 80 alphanumeric characters. This allows multiple measurements to be displayed at the same time and reduces the amount of abbreviations required, simplifying the operation and reducing confusion. All of the programmed set points are stored in permanent memory to eliminate the need to reprogram the system after a shutdown or battery replacement.